There are a bewildering number of woodworking build plans available online. I want to help you cut through that noise for your mitre saw bench. See how working with a temporary mitre saw station helped me think through my final build plans. See the video below for a full walkthrough of my temporary mitre saw station. A short transcript is below the video with additional build notes not covered in the video. Here are a few additional notes about my build plans that are not all covered in the video. I am so glad I set up a temporary mitre saw station using two sawhorses for the intake and outtake feeds!!! While this is a super compact design, I have room in my shop for the full bench. And since I’ll be using my mitre saw for every build, I really don’t want to have to set it up and take it down. I just want to get to work!! Plus, I see some wing designs where the extensions are bowing downward. Those really don’t support the wood, and that’s the whole point of them. And, I think over time they will become uneven and hard to adjust to keep the height correct. But, if you have very little room in your shop, and the bench doesn’t get heavy-duty use, perhaps that would be a good idea for you. It just wasn’t the right fit for me. I saw LOTS of plans online for “ultimate” and “all-in-one” style benches where the mitre saw was just one tool on the bench. And, I saw lots of designs that had the mitre saw set down in a “notch” so that the top of its table was even with the top of the bench. I thought all of those were super designs. But, I also realized that they were beyond my woodworking skillset at this time. I chose a simpler design with the saw simply setting on the bench top. And then I could build a narrow shelf to support the board that would be even with the mitre saw’s table. That shelf will also allow me to build a back riser to use for a stop-block. That’s crazy important and a seriously helpful tool for cutting multiple boards to the same length. And, it will give me empty space on the bench top, behind the saw, for stacking the cut pieces, and clamping a Kreg jig on the end to create pocket holes – which I will be doing a LOT. I’m also excited about that top shelf providing little cubby holes to store things like my tape measure and pencil, as I’ll be using those for every cut project. This is the other reason I want a permanent bench, and not a compact one. I’ll have room to permanently house a dust collection system, whether that will be just the vacuum, or something more elaborate later. And, I’ll have room to store anything else I might need at the mitre saw station, like safety glasses, masks, and ear protection. And I’m sure I’ll be storing more than a few boards there too!!! I had planned to use the big Shop Vac I already had. But, when I laid out all of the pieces for the build, giving a 24” space between the top of the bottom shelf and then the bottom of the top spanner board, I realized it wouldn’t work. That would have put the table of the mitre saw at 37”, which is just too tall for me. I’m 5’6”. Besides being an uncomfortable height for my arms, it would make all that sawdust fly in my face. Nope, not a good idea. So, I’ll either be getting a shorter vacuum, as there are several brands to choose from now, or I’ll more likely just roll my mitre saw station over to the open garage door. That will make it super easy for me to just blow the dust out. FYI, I have a double-wide driveway, so the dust will be blown far away from the house. I definitely don’t want a food pile for termites and carpenter ants near the foundation! After working with my temporary mitre saw station for a while, I discovered that I’m cutting 8’ lumber in two as much as I’m cutting smaller pieces. So, I’ve decided to set my saw in the middle instead of far over on the outfeed side. That’s what I see in a lot of build plans. I found that 3’ on each side holds any length board well. And, the saw being in the middle dictates the placement of the frame support boards too. I’ll be using lag bolts to screw down the saw securely to the bench top and I don’t want to hit one of those support braces. So, I’ll be placing them just outside the footprint of the saw. I may also place one directly under the middle of the saw. That should be nearly equal spacing between them for the length of the frame, but give me more support where the most weight is on the bench. Those brace boards will also give me a good tie-in for any additional support I may want to add later. And, those vertical supports would make super framing if I want to build an additional shelf or storage area with draws or such later. I made sure to do my homework on casters. Each size can hold a different max capacity of weight. I believe 3” casters will hold the total weight of the bench plus the saw just fine. And, I got the kind with brakes because I sure don’t want this bench moving on me while I’m cutting? I’m not sure it’s necessary to have brakes on all 4 casters. It’s like that 2 would be enough – mounted diagonally. But having 4 makes it easy for me to get to any 2 with ease, no matter where I place the bench in the shop. 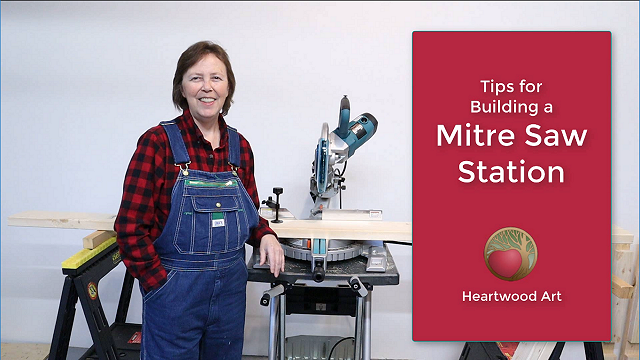 How Are You Building Your Mitre Saw Station? I sure hope these tips helped you think through what you need to build the type of mitre saw station that works best for you. Please do leave a comment about your build and let us know how it worked out for you.